Go to item 70A in our shopping cart. Or buy the special package which includes Alan Lawrie's book, five complete DVDs of NASA films about the preparation and production of the amazing Saturn I and IB rockets and a bonus book of the rare Saturn IB News Reference Manual. This special package can be seen by clicking HERE. 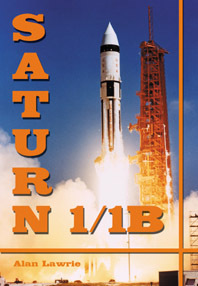 Readers will gain a unique insight into the manufacturing, testing and associated problems of the Saturn I/IB rockets. Readers will have reference access to statistical data unavailable anywhere else, such as details of the engines attached to each stage, and the transportation records of each stage. Readers will learn of the many manufacturing and test facilities used and the current status of each.